Northern California Fly Fishing, Sacramento and Trinity River Fishing Reports, and River News- Redding, CA. 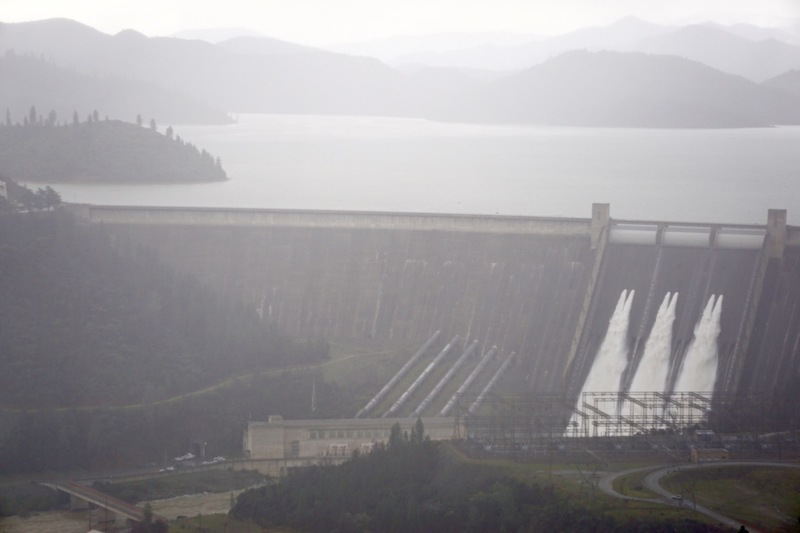 ← Is Lake Shasta Going To Overflow? 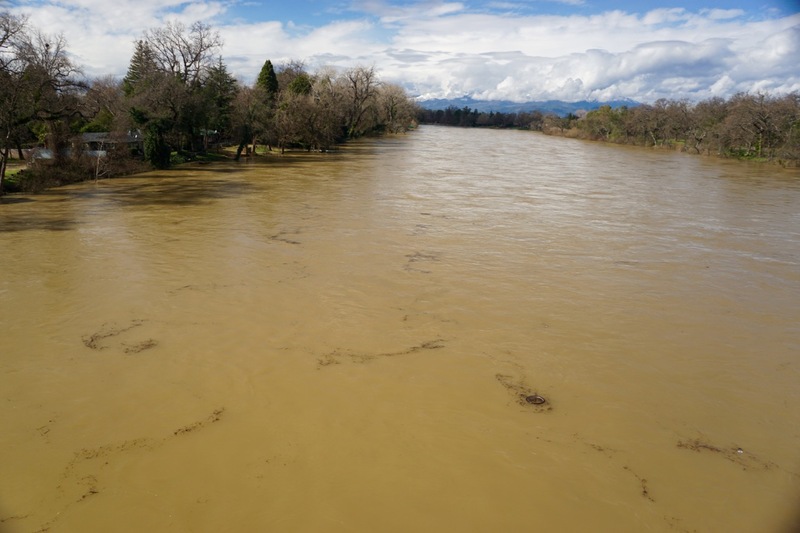 Word of flooding rivers and streams has been blasted across the Northern California region like wildfires in the summer, and this morning brought a rare sight of sunshine. So we decided to grab the cameras and go for a drive to give you all an idea as to what’s happening on our world famous trout river: The Lower Sacramento River. 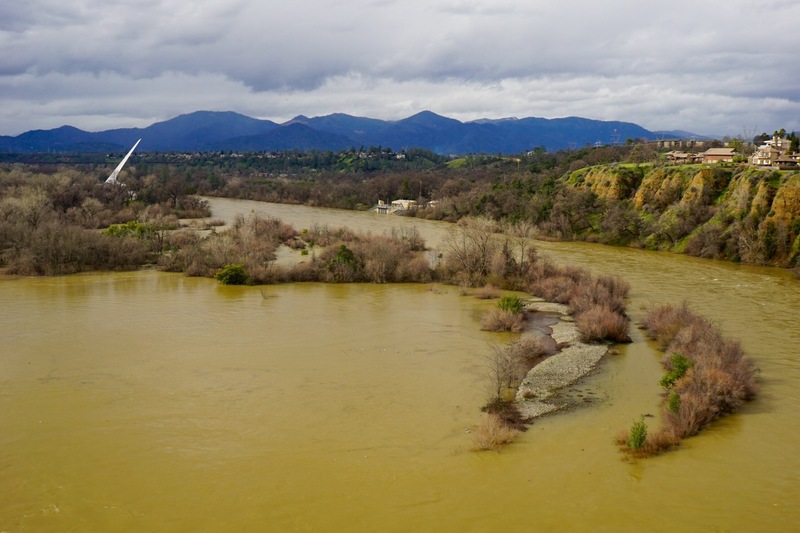 The releases from Kesweick Reservoir into the Sacramento River through Redding, CA are scheduled to reach 50,000 cubic feet per second (cfs) later today, and by Sunday it is slated to peak at a massive 70,000 cfs. 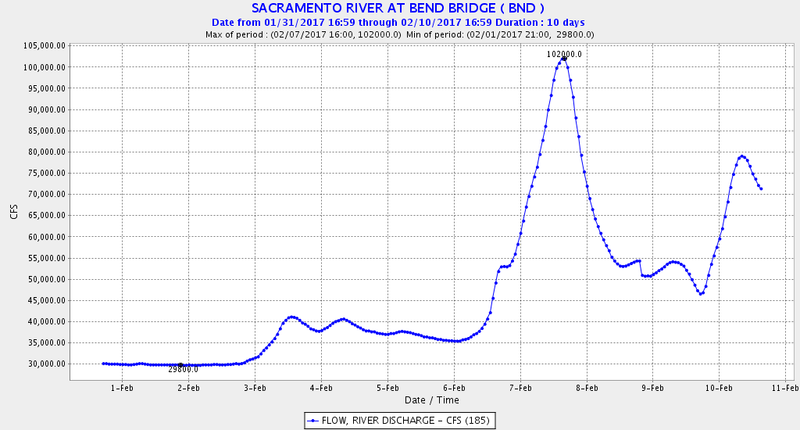 At Bend Bridge on the Sacramento River, just miles above Red Bluff, the local community has been battling the threat of flooding, and on Tuesday February 7th the river surpassed it’s flood stage, breaking the 100,000 cfs mark. 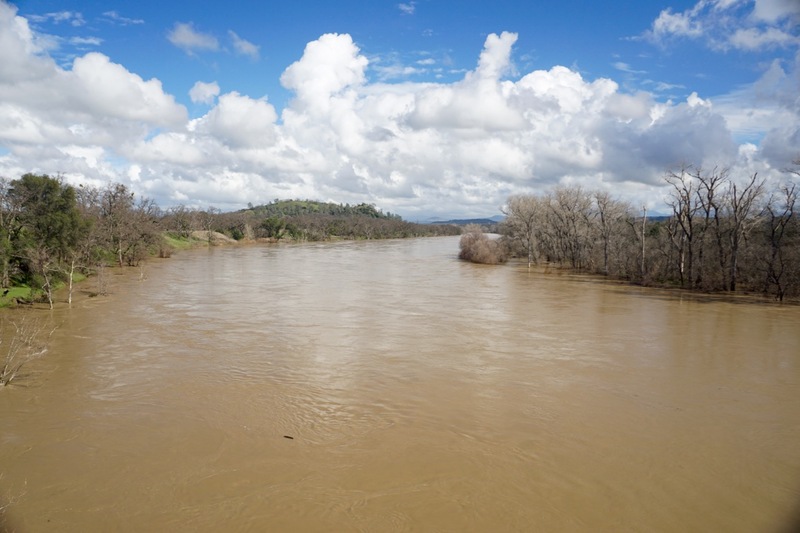 Since then the flows have receded a bit, but with more precipitation expected to fall on a drenched canvas and reservoir releases scheduled to nearly double, dangerously high water possibilities loom on the horizon. We set out south initially crossing the river on the North Street Bridge located above Anderson River Park, a frequented boat ramp. Chances are that if you have floated the river, putting in at the Posse Grounds above the Sundial Bridge, you took out here. Stepping out onto the sunny North Street Bridge in Anderson, CA, a bicycle wheel came floating down, warning any passing cyclist to keep your distance. Just one piece of many that have been washed away by the raging floodwaters. Hopping onto I-5 heading southbound, toward Red Bluff, we noticed the smaller creeks in the area were still swollen compared to the norm, but given the brief break in storms they ran clean. Many even showed signs of full remission. We exited the freeway at Jelly’s Ferry Rd. and headed into the community of Bend, where the river, as expected, was high, muddy, and ran all the way into the trees along the banks. Even the boat ramp, where recently the flows had exceeded 100,000 cfs, displayed water running in its’ parking lot. The ramp, usually a long corridor dropping down to the river edge, was covered by the brown waters. 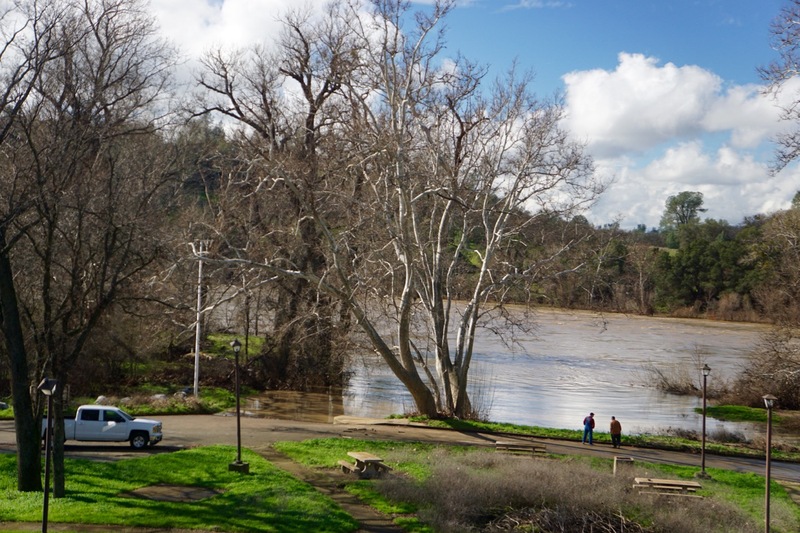 2 locals also came down to inspect the affects of the Sacramento River at the boat ramp under Bend Bridge. Normally there is a 10 foot change in elevation from the top of the ramp to the edge of the river. Just days before, the river had been running through the parking lot. Mud and sand bars displayed the previous high water mark. Here is a view of the river looking upstream of Bend Bridge. Notice the water running through the trees along the banks. The road from there consisted of a backroads tour of boat ramps and lookouts headed back into Redding. Any major tributary to the Sac was similarly high and dirty. The Old Mouth of Battle Creek or commonly known as the Barge Hole is normally characterized by a large gravel bar you could drive out to from the right side of this image. 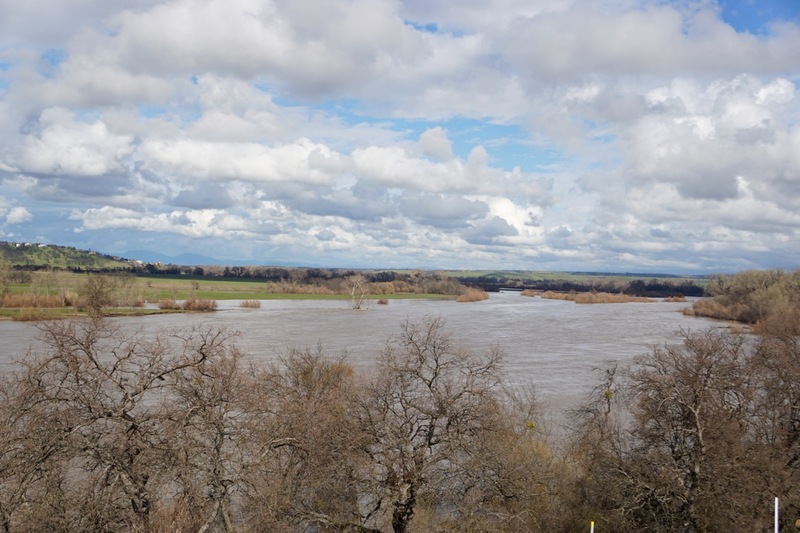 There’s not a chance in making it out there now as the river has breached the bank on the other side, flooding much of the land of Lake California. The vehicle access now hides under many feet of water. 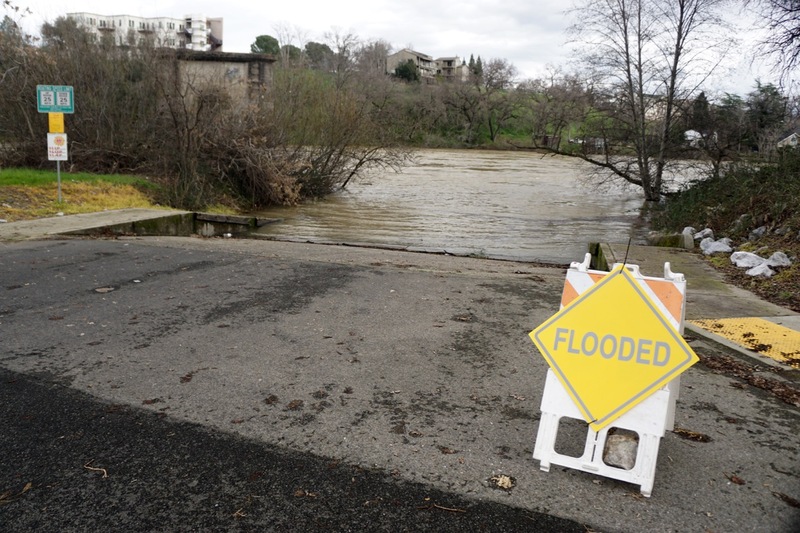 Flooding rivers have plagued roadways and communities over the last week in Northern California. This photo shows the road in front of Gover Ranch struggling to keep dry as the waters of Battle Creek rise. 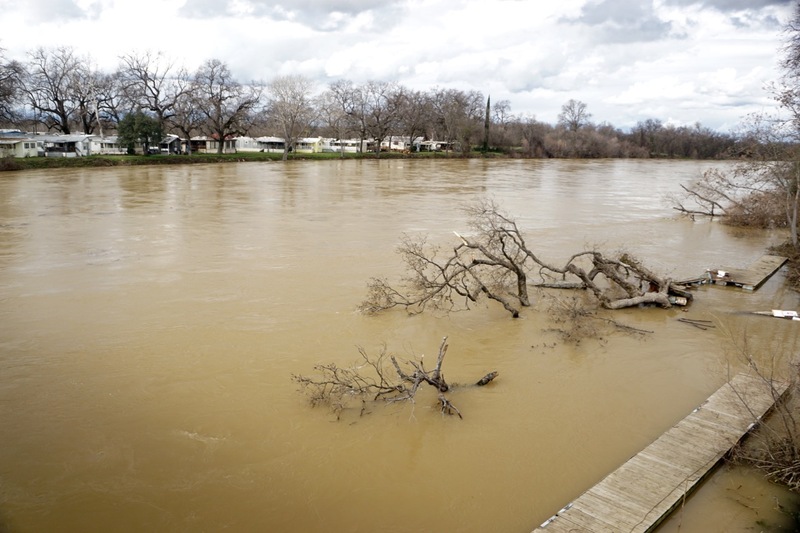 Just days ago when the river flows were at their highest (so far), the RV Park across from Roosters Landing at the Ball’s Ferry Bridge in Cottonwood, CA had river waters flood into it’s community displacing many homes. The fish cleaning station is going to need some major repairs now that this tree has become entangled within it. With 45,000cfs coming out of Keswick Dam, the Bonnyview boat ramp shows water close to the top of its’ access. Normally there is a steep, lengthy decent to the river from where the river is seen here, and with the flows scheduled to see 70,000cfs and possibly more, the parking lot is likely to flood. The earth was shaking as Keswick pumped out some massive volumes of water. Can’t wait to see what this view looks like when nearly double that is scheduled to be released. As we reached the upper reaches of the river the storm clouds moved in and the rain came down, harder and harder as we ultimately reached the Shasta Dam lookout. 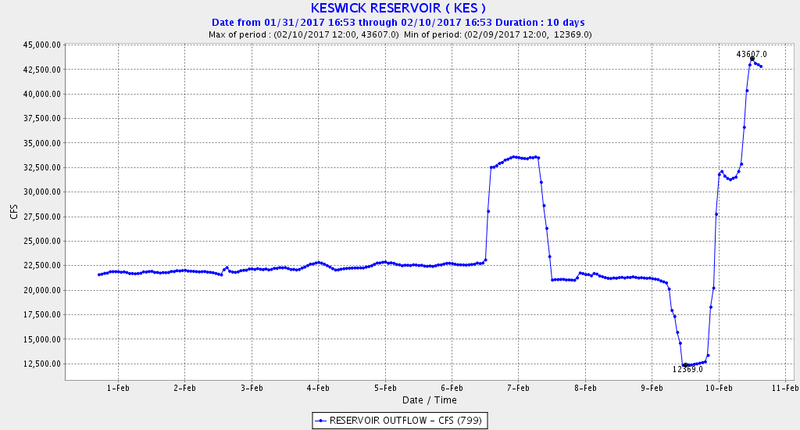 It doesn’t appear that the worst is over, especially since the releases to the Sacramento River from Keswick Dam is slated to reach 70,000 cfs, numbers that the river hasn’t seen since the 90’s. 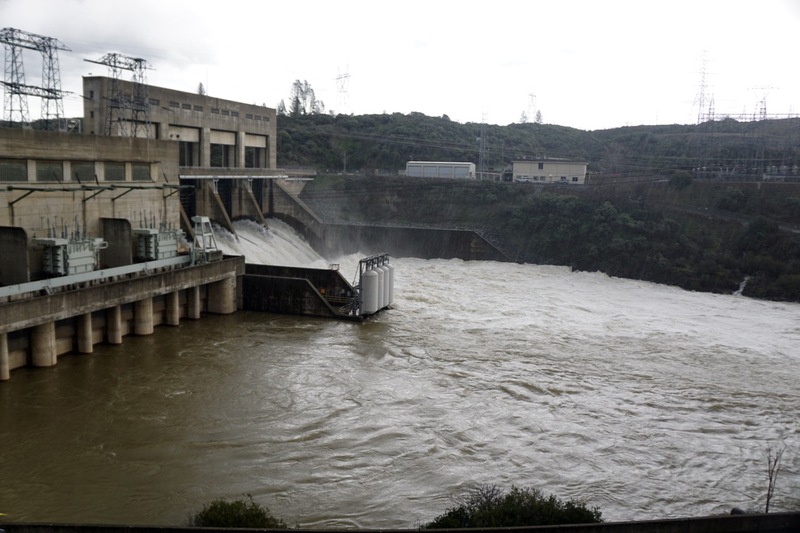 Scheduled Releases out of Keswick Dam near Redding, CA. 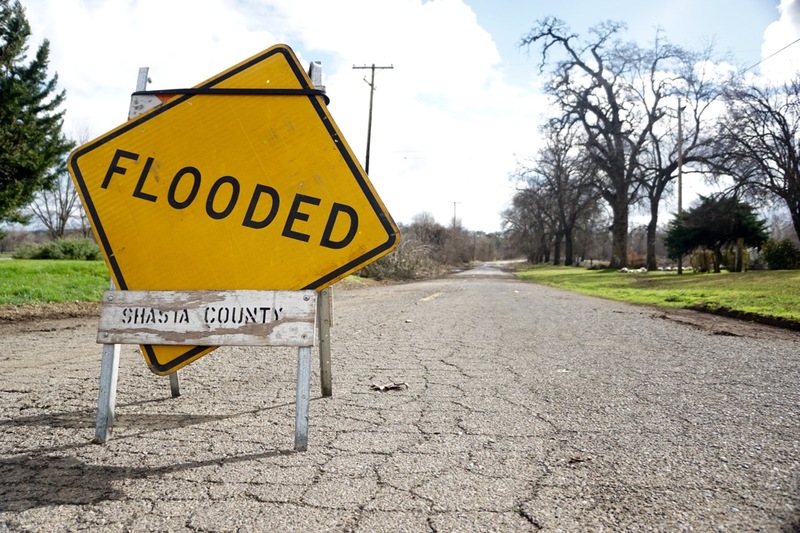 *Shasta County Sheriff Tom Bosenko has closed the Sacramento River to boating and other recreation due to higher than normal water releases from Shasta and Keswick dams. The closure does not apply to lakes and will be rescinded once conditions are safe. Those picks are insane at bend and jellys. Thank you for the props Mr. Brown! Can’t wait to see the river on Sunday! Thanks for the comprehensive reporting. Amazing pictures! Gerald thank you for the feedback. We always appreciate it. Thank you for taking the time to read it! Muddy Waters and Spring Picnics, Kennedy Bros.
Great reporting, I’ve been watching this unfold from down here in SoCal. Your pictures and words really brought it to life! I live on the Sac River in a little town called Meridian! The levee flows on the road above my driveway! The river is almost to the road line, but gone down some! I am concerned about the storms coming and the amount of water that will be here. I have been trying to find something on the Sac River and couldn’t till I stumbled upon you posts!! Thank you so much!! I will follow your page to stay informed!! Thanks for the comment Vicki. We are hoping for the best for you and others who live near the high waters. We do have a storm heading in tonight and the next few days. Hopefully it’s not too much. Crazy how we can go from drought to drenched in one season. What book is the best for Fly Fishing Beginners? Need a last minute Christmas gift for a fly angler?